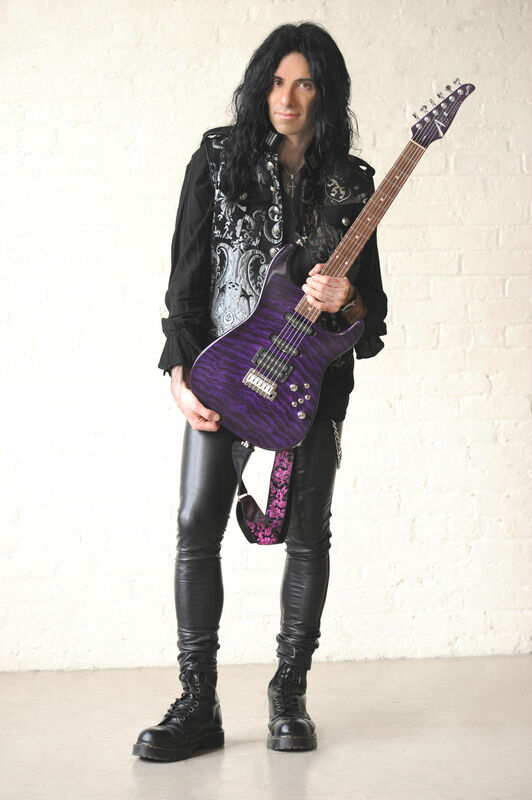 Mike Campese is a New York born guitarist that started playing guitar at the age of 13, and was exposed to music around the house, with his Father being a virtuoso violinist and his brother playing guitar. Mike, the youngest of the family, was heavily into Black Sabbath. Their music inspired him to learn the guitar and he began lessons with a Jazz guitarist. Mike was also heavily into Jimi Hendrix and other artists like Ozzy, AL Di Meola, Van Halen and many more. Mike was very obsessed with the guitar and he played it day and night, hours on end. When he was very young, his Dad encouraged him to listen to all types of music including classical music. He said, “if you want to be a great guitarist you must be open to all types of music.” Mike began listening to the virtuoso violinist Niccolo Paganini, admiring his incredible speed and techniques. He was also listening to Beethoven, Mozart, Yngwie and Vivaldi. Mike was in bands playing clubs, writing and performing at a very young age. After high school, Mike packed up and moved to Hollywood, California to attend one of the world’s top guitar schools, the Musicians Institute (GIT). Mike was studying with many great players such as Paul Gilbert, Scott Henderson, Norman Brown, Keith Wyatt and many others. Attending this school opened up many new doors that exposed Mike to many styles of music. Mike graduated with top honors. Mike returned to New York to hone his skills, he put together and began playing in the areas top band, Mister Strange. The band was touring the northeast, playing in many known clubs like, CBGB’s, Lamoure’s and many big venues. They released a few Cd’s and they where opening for many national acts. After Mike left the band he formed the group, Jeckyl and Hyde, which was an all original project playing the northeast clubs. Mike began writing intensely for his own solo projects. He formed his own band and recorded his first album “Total Freedom.” Mike got the call to be the opening act for the B-52’s, playing an all acoustic show to a sold out crowd and receiving a standing ovation. Mike released his second Cd “Full Circle,” which incorporates several styles of music. It was played on NPR radio across the U.S. Mike’s music and his guitar playing was growing and he was getting a following overseas. Mike continues to hone his skills by studying with guitar legend Stanley Jordan. He has also studied with NY guitarist Wayne Krantz off and on for many years and with Bill Connors of Chick Corea. Mike is a very versatile guitarist. He has played in a African band, pop group and a Jazz band. His main writing style falls in a rock fusion category, that mixes rock, blues, jazz and classical into a single style. 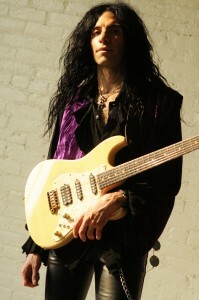 Mike appeared on the Jason Becker tribute Cd “Warmth In The Wilderness,” on the Lion Music label, which was an international release. Mike’s band continued to perform and open for many national acts such as Yngwie Malmsteen on 3 tours, Michael Schenker, The B-52’s, Lou Reed, The members of Yes and Asia, KC and the Sunshine band, Spin Doctors, Sebastian Bach, Dokken, Kip Winger, Rik Emmett Of Triumph, Vinnie Moore, Joe Bonamassa, Jon Oliva, Geoff Tate of Queensryche, Avatar, Michael Angelo Batio and many more. Mike played the National Anthem at hockey games at the Pepsi arena and for a local baseball team for thousands of fans. Mike has worked with Jimi Hendrix’s best friend Mike Quashie, writing and arranging and later led to Mike playing “The Max’s Kansas City” Benefit at the bowery ballroom, with Rob Stoner from the Bob Dylan band on bass and Dennis Diken of the Smithereens on drums. Headlining the show was Little Steven of Springsteen, Lou Reed, Garland Jeffreys and Sylvain Sylvain of the New York Dolls. Mike performed at the Cruefest 2 show which featured Motley Crue, Godsmack, Drowning Pool, Theory of a Deadman, Rev Theory and more. Each year Mike performs at the NAMM show in Anaheim, California for the companies that he is endorsed by. The NAMM show is the largest trade show in the world and Mike has been playing there since 2007. Also, Mike is a regular performer at “First Night” in Saratoga Springs, NY on New Year’s Eve and he is the first person to ever play along with a fireworks display in Saratoga. Mike released his 3rd Cd “Vibe” that has a classical influence, as well as other musical varieties. By this time Mike’s following overseas earned him radio play in several countries. In 2004, Mike was hired by the Trans-Siberian Orchestra and received a Gold record for his work. In 2005 Mike released his fourth release “The New” which features some of Mike’s best playing and writing. By this time Mike’s music is featured all over the internet and all over the world. Mike has been featured in many national guitar magazines such as Guitar Club in Italy, Guitar One and writes writes 2 page lessons for Guitar Player magazine, Guitar World magazine and Guitar Club Magazine. Check out the February issue of the Guitar Player Magazine, Mike has a 2 full page guitar lesson as well as the April issue of the Guitar World mag and in the January 2014 issue of the Guitar Club magazine. In Italy, Mike has been writing 2 page lesson columns for Guitar Club each month and has a 3 page interview feature in the October 2013 issue. Also, Mike writes for Axe magazine, which is Italy’s top guitar magazine. Mike has his own guitar column each month. Mike teaches over 70 students a week, and is one of the top teachers in the NY area. He has a constant waiting list and some of Mike’s students are from or went to successful bands. Mike has been judging the Guitar Center, Guitarmageddon and the “King of the Blues” contest for over 5 years now. Mike has released 3 instructional DVDs for Chops From Hell, “Virtuoso Rock Fusion Concepts”, “Creative Speed-Building Picking Techniques” and “Melodic Shred.” Mike also writes lessons for several online sites such as Guitar9.com, Ibreathemusic, Chops From Hell, Shed Academy, Premier Guitar, The Sound Guitar Magazine and many more. Mike’s 5th solo release “Hidden Treasures” is mainly an all acoustic release. This is the Cd Mike always wanted to do to express his passion for the love of the acoustic guitar. This is not your ordinary acoustic guitar Cd, it has a very colorful mix of different musical textures featuring Mike’s virtuosity on the acoustic guitar. Mike’s fan base is growing internationally and his music has appeared on national radio and TV. Mike’s music has been used for a Lions Gate movie and he even appeared in a Busta Rhymes MTV music video. “The Meaning Of Christmas” is Mike’s 6th solo release. This CD features some of Mike’s balls to the walls guitar playing with his own original arrangements of 10 holiday classics and 2 of his own original compositions. Mike released his 7th solo Cd “Electric City” in the summer of 2010. The 14 song, over 76 minute Cd is filled with some of the most blistering guitar work Mike has ever recorded. “Electric City” has been getting a lot of press and radio play all over the world. Mike’s 8th solo Cd was released in the fall of 2013 and it is called “Chameleon”. This 12 track Cd features some of Mike’s best compositions and Mike dials in his versatile writing skills that he is known for and there is a special guest solo on the cd by Vernon Reid of Living Colour. Mike continues to tour solo and with a 3 piece band. In the fall of 2013, Mike traveled to Italy to do a Italian guitar clinic tour that was very successful. In July 2016, Mike releases his 9th studio album, “Chapters”. The 15 song, 67 minute album is mainly all acoustic, with a splash of electric guitar. The music on this album was written in Italy and Hawaii, during Mike’s journeys and inspiration. In the summer of 2018, Mike traveled to Europe to do a European tour of 3 different countries, Italy, UK and France. Immediately following his tour, he releases his 10th solo album, “The Fire Within”. The new album has 12 new songs and it is Mike’s heaviest album to date. It is getting great reviews all over. To sum it up, Mike is a all-around music performer, session artist competent in many musical styles, electric and acoustic.